Grandmama likes to sing "Twinkle Twinkle Little Star" to me. I've always wondered what is a Star. Finally found out yesterday. Papa was eating Stars. Well, I reached upon Papa's bowl and grabbed a star. I didn't know then that stars can be eaten till now. It taste real sweet too. 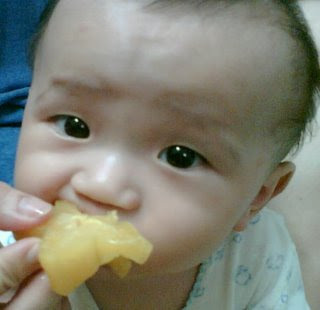 Mama said "Star fruits are an excellent source of vitamin C, is low fat, and naturally sodium and cholesterol free". I want some more please.